You don’t have to travel to California or France to spend time in the middle of wine country. 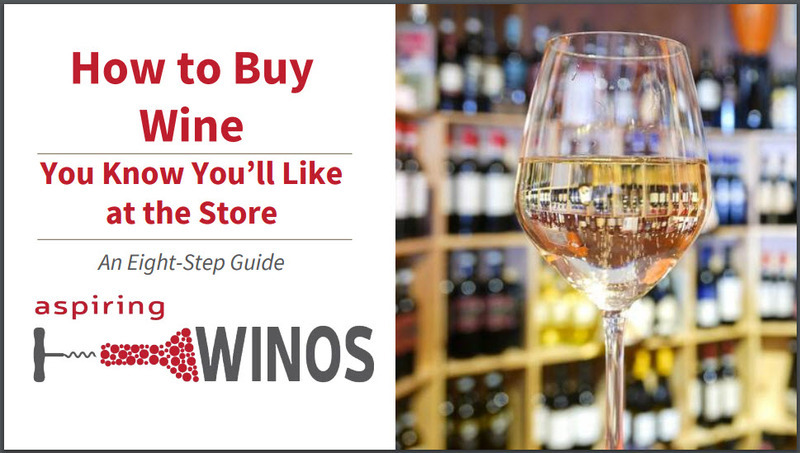 There are two wine producing regions located right in Arizona! In Northern Arizona, there is the Prescott and Verde Valley which has hundreds of acres of vineyards on rolling hills. The hot days and cool nights are the perfect recipe for delicious grapes and great tasting wine. There are also two wine regions in Southern AZ about an hour apart – the Willcox and the Sonoita-Elgin regions. There is nothing quite like camping and enjoying nature with a bottle of locally-sourced delicious wine to enjoy. 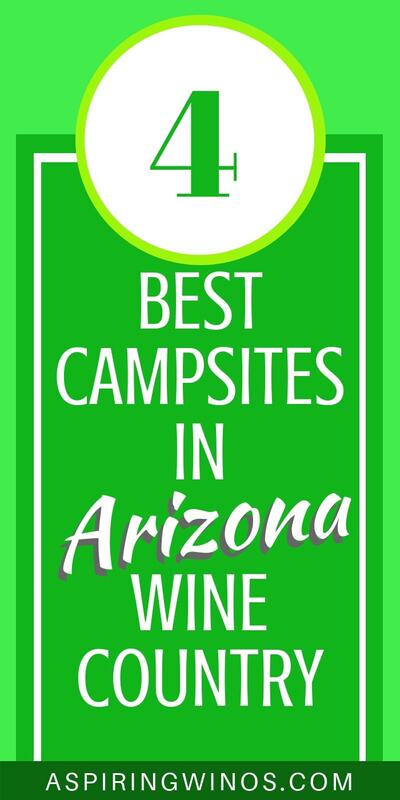 Here are a few of the best campsites in Arizona’s Wine Country. Nestled in Prescott’s Granite Dells is the Point of Rocks Campground. It is family-owned and operated and is in the heart of Northern Arizona Wine Country. Try to grab a campsite near Watson Lake as it is absolutely breathtaking. When you have an RV or a pop-up camper, this is the perfect place to stay. You can pop your tent up on an RV site too. Each site has power with limited WiFi. Doubt you will miss being connected when you are enjoying a gorgeous Arizona sunset with a glass of Rose in your hand! 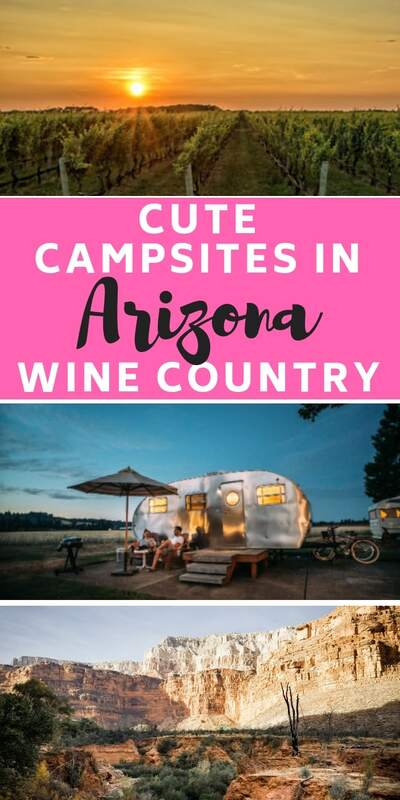 When visiting the wineries in Northern AZ, make a reservation at the Clear Creek Campgrounds if you also want to enjoy the quiet solitude of nature. Clear Creek is known for its fishing, swimming, hiking, and wildlife viewing. The campground is surrounded by tall, shady cottonwoods and is pretty flat with a lot of grass. Sit back in your camp chair and breathe in the fresh air and sip on a glass of white wine in one of the most beautiful campsites in wine country. A lesser known, but stellar campground located near Chiricahua National Monument is Bonita Canyon Campground. Mature oak trees and beautiful campsites await you after a day of wine tasting in Southern Arizona. These campsites are small so leave your big rigs at home and grab your tent and sleeping bag. Enjoy time by the campfire with friends and tell ghost stories while enjoying a bottle of red from that day’s tasting. When you want to camp near a lake to either cool off or do a little fishing for trout, head to Riggs Flat Campground. Note though that the road is long and windy. You’ll want to bring your bottles of wine back to camp and cookout over the campfire or on the grill. This campsite has all the basics, but you will want to bring enough water for your trip. The sites tend to be smaller and can fit regular sized RVs and tent campers with no problem. Perfect to have on hand in case you spill any wine, which would be a crime!